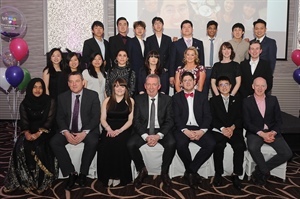 The LYIT annual Student Achievement Awards evening took place recently (4 April) in the Radisson Blu Hotel, Letterkenny. 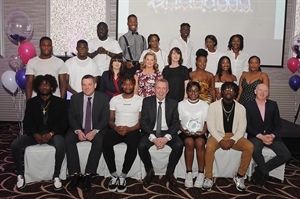 It was an evening of style, glitz and glamour all around, as over 230 students and staff gathered to recognise and celebrate the achievements of this year’s Clubs and Societies at LYIT. 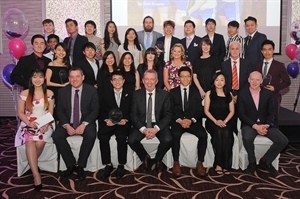 Pictured are members of the Malaysian Students Society – winners of the 2019 Best Society Award and the 2019 Best Society Promotional Video Award. 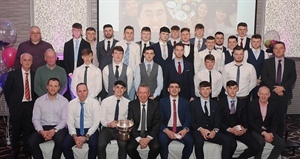 Pictured are the Men’s GAA Team – winners of the 2019 Team of the Year Award. Pictured are members of the African Society – winners of the 2019 Award for Best Society Photograph. Pictured are members of the Badminton Society – winners of the 2019 Award for Best Society Poster. Among the awards presented were: Most Outstanding Club Member, Leadership Award, Best Society and the Civic, Charity & Community Engagement Award. This year also saw the introduction of three new awards: Best Poster, Best Photograph and Best Promotional Video – all of which had a high volume of entries. The competition for all award categories this year was extremely strong and this posed some tough decision making for the selection committee in choosing the winners. Eamon McGee, 2012 All-Ireland medal winner with Donegal and current Gweedore player, was the guest speaker on the night and presented the Clubs and Societies awards. In his address, Eamon reflected on his college years, having won two Sigerson medals. Eamon also highlighted the importance of establishing the proper study and social balance, and encouraged the students present to pursue their ambitions while mindfully learning from the experience of their peers. Eamon also emphasised the importance of the contribution that clubs and societies make to college life in terms of personal development and wellbeing. Clubs & Societies Scholarships were also presented to nine successful candidates. The winners were selected from a large pool of applicants and a diverse range of clubs and societies. Each of the winners received monetary awards in recognition of their achievements. Paul Hannigan, LYIT President, presented the scholarships to the winning students and complimented all Clubs and Societies on the significant contribution they have made to campus life. Paul also welcomed how the Institute has continued to embrace cultural diversity in line with the significant increase in international students choosing LYIT as a place to further their studies. Best Society Promotional Video 2019 – Malaysian Society. GAA Men’s Team, Team of the Year. The winner of the Most Outstanding Club Member, Edward Ng, and the winner of the Best Society Promotional Video, the Malaysian Students' Society, will now go on to represent LYIT at the National BICS (Board of Irish Colleges) Awards which are taking place in Athlone on Thursday, 11 April.